It is customary among Filipinos working overseas or aka OFWs to send packages or "balik-bayan boxes" to their relatives in the Philippines. This is one of the ways they extend their affection as they pamper their family and relatives with goodies back home. Chocolates, clothes, toys, and sometimes even gadgets are being sent to Philippines. Of course, one of the problems many OFWs complain about are missing items in their packages or worse, their package never reaches their family in Philippines. This is the reason why the DTI is always reminding the public, particularly the Filipinos abroad to send their packages or balik-bayan boxes to DTI accredited freight forwarders only. Through this, senders can go after and report the freight forwarder in case of missing items or undelivered packages. Below are the accredited freight forwarders according to DTI. 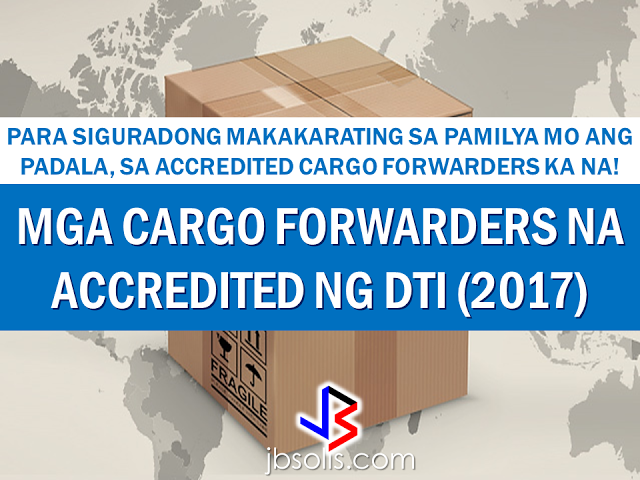 The information posted here has been updated based on the most recent list of cargo companies released by DTI as accredited. LBC Express, Inc. LBC Australia Pty Ltd.
Sydney LBC Express Inc. LBC Australia Pty Ltd.
Muara LBC Express, Inc. LBC Mabuhay Brunei Sdn. Bhd. Edmonton 12:24 Cargo Express Corporation Forex Alliance Cargo Inc.
China Huangou We-Go Logistics Int'l. Corp. Shenzhen Full-Trans Logistics Co., Ltd.
Ningbo We-Go Logistics Int'l. Corp. Shenzhen Full-Trans Logistics Co., Ltd.
We-Go Logistics Int'l. Corp. Shenzhen Full-Trans Logistics Co., Ltd.
Shekou We-Go Logistics Int'l. Corp. Shenzhen Full-Trans Logistics Co., Ltd.
Shenzhen We-Go Logistics Int'l. Corp.. Shenzhen Full-Trans Logistics Co., Ltd.
Tianjin We-Go Logistics Int'l. Corp. Shenzhen Full-Trans Logistics Co., Ltd.
Xingang We-Go Logistics Int'l. Corp. Shenzhen Full-Trans Logistics Co., Ltd.
Guam Guam LBC Express, Inc. Baker International, Inc.
I-Genex Cargo Forwarder General Cargo Express Ltd.
LBC Express, Inc. Advance Global Systems, Ltd.
Kowloon Logistics Worldwide Express and Global Forwarding, Inc. Logistics Worldwide Express Inc.
Tokyo LBC Express, Inc. Transtech Co.,ltd. Coriner Global Express Logistics and Trading Corporation Five Star Shipping Co.
Korea Busan Cadano Cargo Transport Services, Inc. Hanpas Co. Ltd.
LCSN Express Movers, Inc. Falcon Cargo International Co. Port Klang LBC Express, Inc. LBC Mabuhay Malaysia, Sdn. Bhd. I-Merex Group of Companies, Inc. Jazeerah Al Khaleej Int'l Shipping Co.
Sky Land Global Logistics, Inc. Kamal Hassan Al Wassia Est. Mac-Nels Line, Inc. Jolly-B Box Express PTE Ltd.
Royal Cargo, Inc. Royal Cargo Combined Logistics (S.E.A.) Pte. Ltd.
Barcelona LBC Express, Inc. LBC Mabuhay Cargo S.L. We-Go Logistics Int'l. Corp. Complete Shipping and Logistics Co.,Ltd. United Kingdom Felixstowe LBC Express, Inc. LBC Express Ltd.
Thamesport LBC Express, Inc. LBC Express Ltd.
London E-pad Freight Forwarder Highlight Express Int'l. I-Merex Group of Companies, Inc. Imerex Group of Companies Inc.
Royal Cargo, Inc. UCANS Global, Inc.
U MAC Forwarders Express, Inc. Hi-Phil Express, Inc.